In most industrialized populations a strong association between blood pressure and body weight has been established. Several large-scale studies in the United States have confirmed the relationship between obesity and hypertension (the Framing-ham Study (Kannel et al. 1967); the Evans Country, Georgia Study (Tyroler et al. 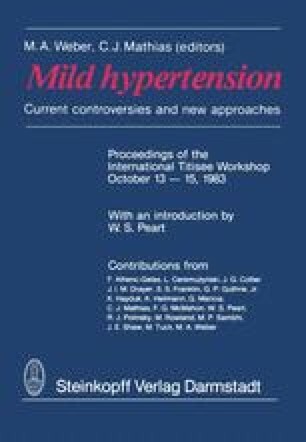 1975); the Community Hypertension Evaluation Clinic (Stamler et al. 1978); Hypertensive Detection and Follow-up Program Cooperative Group (1979)). In the Evans county, Georgia study it was demonstrated prospectively that weight gain can increase blood pressure. Over the six-year period of the study, weight gain was associated with a two-fold possibility of developing hypertension. The converse was also true: subjects who were hypertensive at outset gained more weight. In those who were both obese and hypertensive at the outset, a weight reduction programme averaging 8 kg per patient produced very pronounced decrements in both systolic and diastolic blood pressure over a year. Comparing black and white subjects, it was concluded that obese white hypertensives benefited more than blacks from weight loss.